External Stereo Speaker Output Terminals, 3.5mm stereo Headphone Jack. Power Indicator, 2 Built-in Speakers, off and on volume Rotary Knobs control and Dust Cover. Power: AC110V 60Hz(UL) 1 Year direct Boytone USA warranty. boytone BT-17TBC record player turntable 3-speed turntable including cassetteplayer with 2 built-in speakers on the said that project great sound!Additional features include external RCA speaker output jacks, 3.5 mm stereoheadphone jack, power indicator and dust cover. 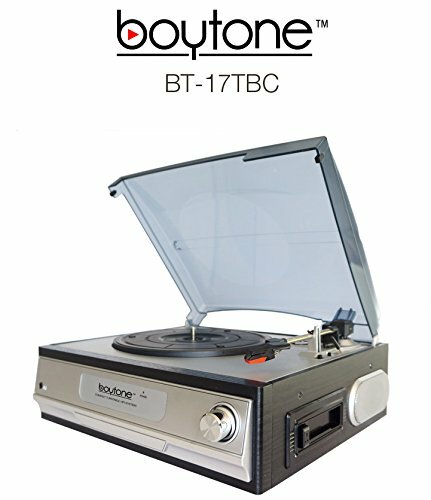 boytone BT-17TBC is belt-driven turntable spins 7, 10 or 12-inch records at speeds of 33, 45 & 78 RPMso you can enjoy your. This turntable a silver & black color. Power Source: AC110V(UL). The BT-17TBC is packed with all the features you need, at a trulyincredible value!